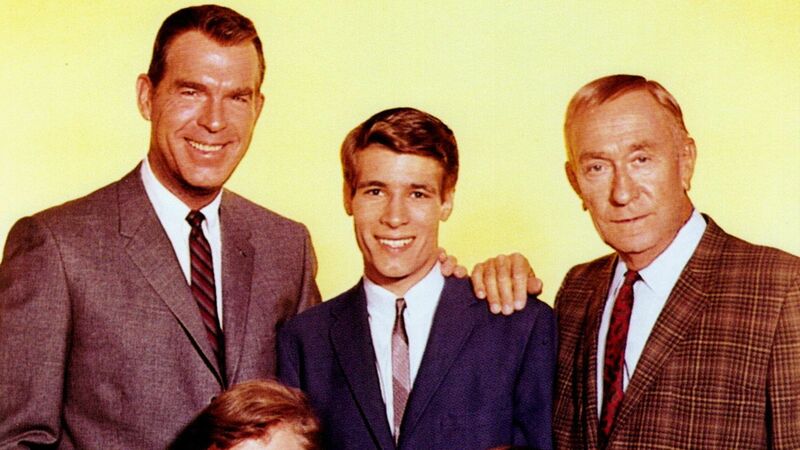 Here's where to watch every episode of My Three Sons season 9. Mouseover or tap an episode to see where to stream it. Click or tap the play icon to stream it on the best available service. The Great Pregnancy Sep 28, 1968 While the family is doing some spring cleaning, Katie faints behind the couch. Soon her mother's intuition brings her to the house and she announces that Katie is going to be a mother. Once it is confirmed by a doctor, the family dotes on Katie, but seems to ignore the father to be. Dr. Osborne, M.D. Oct 5, 1968 Controversy erupts in the Douglas household over the selection of a doctor for Katie during her pregnancy. While Robbie and Katie want to choose their own doctor, Katie's mother insists on making an appointment with the Miller family doctor. Meanwhile, Steve stands in for an absent Robbie at his first baby class. Life Begins in Katie Oct 12, 1968 The baby stirs inside Katie and Robbie feels its movement and suddenly sheds his youthful ways to become very much the sober and altogether too serious expectant father. Meanwhile, fatherhood is taking a different approach when Tramp's puppies to the next door neighbor's dog Francis, are about to be born. The Grandfathers Oct 19, 1968 Because he is about to become a Grandfather, Steve has an easier time working out an important Air Force contract with a hard-shelled General. By watching the way Katie walks, the General predicts that she will have a baby boy. Meanwhile Ernie decides to run for class President at school. The Baby Nurse Oct 26, 1968 When Robbie and Katie announce that they might hire a baby nurse, Uncle Charley is confident they will ask him. When they don't, he embarks on a marathon of baby sitting so he can learn the ropes by hiring himself out as a professional baby sitter. Big Ol' Katie Nov 9, 1968 In an advanced stage of pregnancy, Katie suffers qualms about her looks that are as out of proportion as her figure. She is temporarily distressed by her hugeness until she learns from her doctor that she is going to have more than one baby. My Three Grandsons Nov 16, 1968 The day -- or rather the night -- of the big event finds expectant mother Katie quite calm, and Steve and Uncle Charley quite the opposite, and a hapless father to be off on Army manouvres. At the hospital, Katie gives birth to identical triplet boys and Steve must adjust to the fact that he is a Grandfather, three times over. Tea for Three Nov 23, 1968 As the triplets come home from the hospital their names are announced by the happy parents: Robbie Jr, Charley and Steve II. Their father Robbie finds that he is totally unprepared for all of the attention that the infants attract. Back to Earth Nov 30, 1968 It may not be poker, but nine in the Douglas family is a full house. Feeling somewhat responsible, Robbie decides to quit school in order to pursue work full time and find a new home for his family. A wise school counsellor takes steps to discourage the move. Meanwhile Steve designs some plans for an extension to the house to accomodate the babies further. First Night Out Dec 7, 1968 Robbie and Katie have been invited to a High School reunion and they are reluctant to leave their babies with an unknown sitter as everyone in the family is otherwise busy. They hire a professional sitter that is recommended by the family doctor. Cassanova O'Casey Dec 14, 1968 On the rebound after his girlfriend Sally suddenly marries another younger man, Uncle Charley acquires many new lady friends when Katie schemes to put the wind back in the lovable old windbag's sails. Expendable Katie Dec 21, 1968 With three babies to look after, Dr. Osborne says Katie is completely exhausted and he prescribes a couple of days bed rest. She flies to Santa Barbara to be with her mother. While she is away the family must hire three cleaning ladies to restore the house back to normal. The New Room Dec 28, 1968 The contractor that Steve hires to add a baby alcove to Robbie and Katie's room leaves much to be desired. He displays all the charm of a top sergeant and is putty in Katie's hands, but is exasperatingly gruff and non co-operative to the males in the Douglas home. The Fountain of Youth Jan 4, 1969 Steve meets an attractive widow who seems to be very interested in him but suddenly she turns cool towards his intentions. The family does its best to give the impression that Steve isn't really as old as he seems. Three's a Crowd Jan 11, 1969 Although Katie confidently calls the look-alike triplets by name, other members of the family doubt her accuracy, and when Steve helpfully bathes them, she admits that she can no longer tell them apart because he washed off the inkdots put on their feet. They must be taken back to the hospital for proper identification. Chip and Debbie Jan 18, 1969 Chip and his girlfriend announce to a startled Douglas family that they plan to marry and continue high school. Disapproving, Steve visits the girl's parents but they decide not to forbid the marriage but wait for further developments. When Katie becomes ill and Robbie takes her to the doctor, Chip and Debbie are left with the triplets for some hectic hours. What Did You Do Today, Grandpa? Jan 25, 1969 The Douglases feel that Steve is becoming sedentary, not knowing that he's just been assigned to help capture some enemy agents, but things get rough when he's taken to a Greenwich Village cocktail party where the spies start shooting when they find him hiding in the bathtub. Chip on Wheels Feb 1, 1969 Steve Douglas gives Chip a well-preserved second hand car for his 16th birthday but he is astounded by his son's unenthusiastic reaction; he is embarrassed to drive it, and parks it a long way from school so he won't be recognized as the old car's owner. Honorable Expectant Grandfather Feb 8, 1969 Steve's old Chinese friend transfers to Los Angeles and happily renews his friendship with the Douglases. He confides in Steve and Charley that he is concerned about the man his daughter has married - an aparently aimless hippie with long hair. The Other Woman Feb 15, 1969 Chip and Ernie observe their married older brother, Robbie, in the company of a glamorous woman. The boys report the upsetting situation to their father Steve, who assures them he has trust in Robbie and urges them to maintain confidence in their older brother too. Goodbye, Forever Feb 22, 1969 Young Ernie is crushed when he learns that his next door neighbors are selling their house, and his best friend is leaving the neighbourhood. Pending their separation, the two boys are together day and night; the Douglases give Gordon a touching farewell party. The O'Casey Scandal Mar 1, 1969 Ernie and his girlfriend are dismayed when Uncle Charley and her grandmother don't act like old folks after they meet at a school band contest. Ernie confides in his amused family about his concern over Uncle Charley's behaviour. Ernie's Pen Pal Mar 8, 1969 Ernie bemoans the task of writing in Spanish to a Latin-American pen pal but she then astonishes him by accepting a dinner invitation by cablegram; Maria is the daughter of a high ranking diplomat. Ernie, the Transmitter Mar 15, 1969 After being the only one in his class to choose the correct color in a card test, Ernie is convinced he has extra sensory perception. He predicts disaster for Robbie and Katie if they keep an appointment for the babies with Dr. Osborne. The Matchmakers Mar 22, 1969 Steve's co-worker and golf buddy, suggests that Steve and two of his sons, go to the company picnic with him and his two children. To the parents' dismay, the youngsters take an immediate dislike for each other. Ernie is Smitten Mar 29, 1969 Ernie attempts to remould his image after a classmate he is attracted to, Margaret, refuses to give him a second look. Margaret, however, prefers Roger and is obviously disappointed when Ernie is selected as her partner in a poem recitation. Two O'Clock Feeding Apr 5, 1969 When old Bryant Park friends move into the neighbourhood, they renew their friendship with the Douglases at a family barbecue where Steve is cast in the role of marriage counselor by the eldest son who turns to him for help in saving his marriage. Teacher's Pet Apr 19, 1969 Ernie's writing ability lands him in the dreaded special English class with its strict but efficient teacher. Her reputation as an ogre keeps him so uncomfortable that he not only performs badly in oral recitation but in his written work as well.